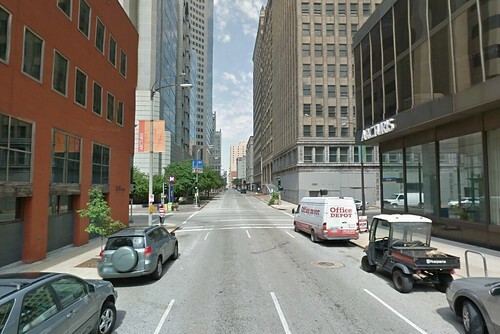 How many fully intact urban intersections are there in Downtown St. Louis east of Tucker? By fully intact urban intersections, I mean all four corners are defined by a building that is built out to the corner (or close to it). This means no parking lots, no parking garages, no buildings set far off the street by a plaza, no driveways, etc. This definition of what makes an intersection fully intact and urban is admittedly subjective. 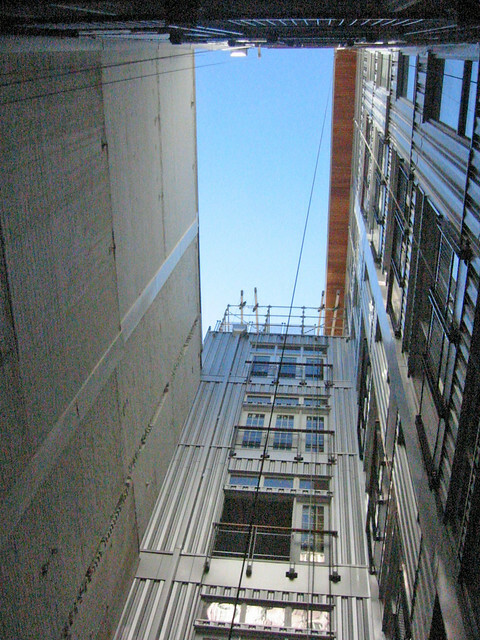 While parking garages are found in urban settings, with the exception of ground floor uses other than cars, they don't contribute much to a thriving urban environment. Looking at a map of the Central Business District, bound by Chestnut, 4th Street, Washington and Tucker, there are only 5 intact urban intersections. Intersection 1: 9th & Washington bound by the Bankers Lofts, The former Lennox Hotel (most recently the Renaissance Suites), the Renaissance Grand Hotel and the Renaissance ballroom building. Intersection 2: 8th & Olive, bound by the Laclede Gas Building, the soon to be renovated Arcade Building, the Old Post Office and the also soon to be renovated Chemical Building. 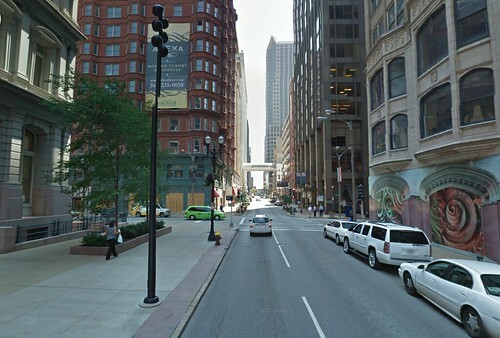 Intersection 3: Broadway & Olive, bound by the St. Louis Place building, Metropolitan Square, The currently empty but very attractive Lasalle Building and the Marquette Building. 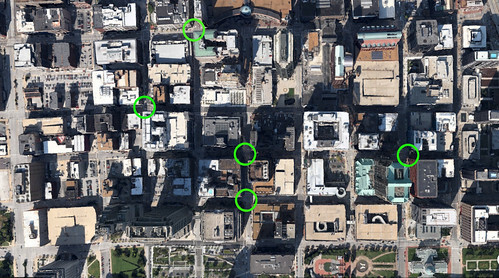 Intersection 4: 8th & Pine, bound by the Wright Building portion of the Arcade, the Laclede Gas Building, the Wainwright Building annex, and the AT&T data building. The AT&T building is admittedly not the most urban building, but the corner includes a Metrolink station entrance and a small convenience store. This intersection at 4th & St. Charles almost made the list, but the Gentys Landing building is fronted on the first floor by a covered drive. The last on the list is 10th & Locust, which in its present state is perhaps the only intersection in the CBD with the potential to have active retail or restaurant uses on all four corners. If plans by Urban Street Group proceed as rumored (since no real plan has been made public), the former Noonan Kocian Art Company (later Fatted Calf) building and at the northeast corner of the intersection and the adjacent 4-story building at 919 Locust will be demolished and could be replaced with an entry drive for development in the former Scruggs annex near the middle of the block. This would bring the number of intact urban intersections in the CBD to four. Not surprisingly with many surface parking lots, Downtown south of Market has none, and Laclede's Landing also has none. 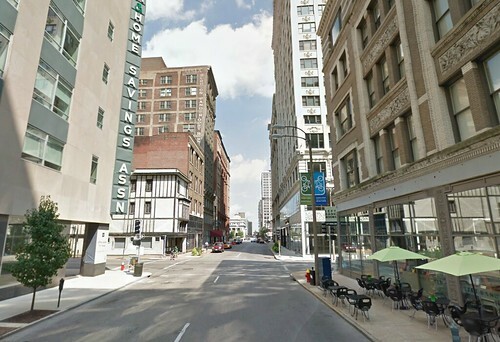 West of Tucker there are a few with 13th & washington being one of the best Downtown and one at 17th & Locust. 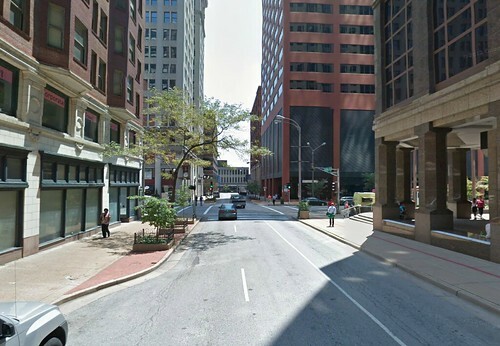 Urban Street to turn 10th & Locust into Suburban Street? 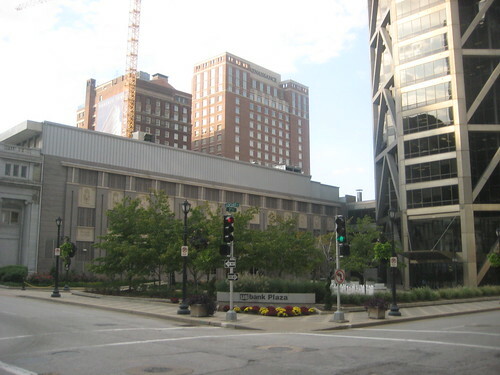 Last week the St. Louis Board of Aldermen Housing, Urban Development and Zoning Committee gave unanimous approval for Board Bill 2, which is a redevelopment plan proposed by Urban Street Group of Chicago for several buildings purchased from the Robert's Brothers. 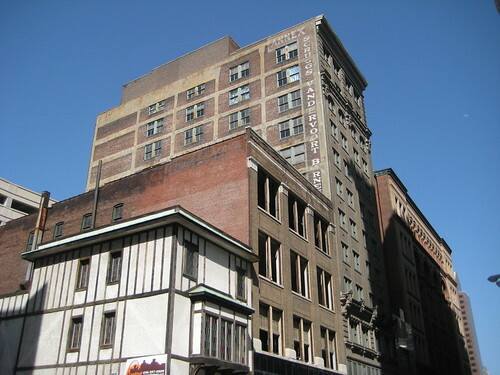 As part of the redevelopment of the buildings along Locust, the two buildings above, at 919 and 923 Locust would be demolished. The board bill gives no details about what is proposed to replace the two buildings, but according to St. Louis Core, 7th Ward Alderman Phyllis Young the area at 10th and Locust would follow "urban design and landscaping standards" including possibly public art, a pergola and other amenities. Last month NextSTL published a fascinating history of the corner building at 10th and Locust which housed the Noonan-Kocian Art Company from 1912 through 1958. 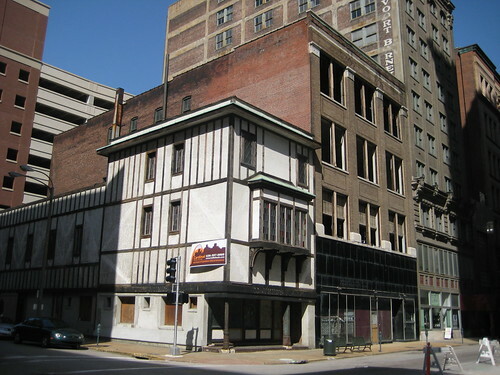 The building shows up in the 1875 Compton & Dry Pictoral St. Louis, and may have been originally constructed in the Antebellum period, making it one of the oldest buildings in the Central Business District. The buildings proposed for demolition are not currently listed on the Nation Register, nor are they part of a larger historic district, so the proposal would not be required to be reviewed by the Cultural Resources Office or the Preservation Board. With its history, the 923 building would likely be eligible for individual National Register listing if the 1970's Tudor skin is removed. 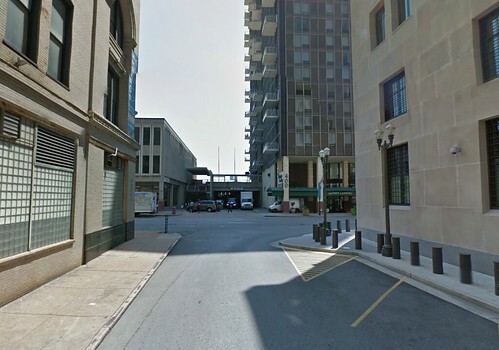 Two Downtown buildings could be replaced by a pergola? Really!??? According to various sources, Urban Street wants to demolish the two buildings in order to get more windows in the tall skinny building in the middle of the block. 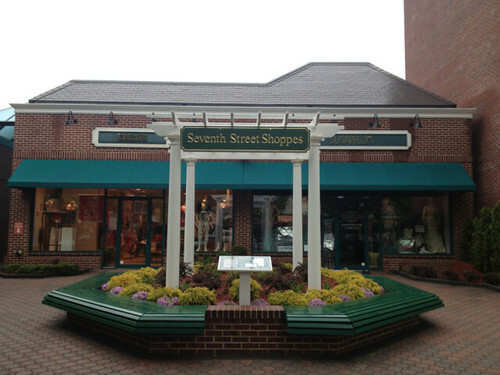 The tall building at 917 Locust was constructed as an annex to the Scruggs Vandervoort Barney department store which occupied the entire block across Locust in the Syndicate Trust and Century Buildings. Earlier articles had indicated that Urban Street wanted to turn the building into apartments, but the board bill refers to a new boutique hotel at this location. In either case, getting light into the lower floors of the larger building is a poor excuse for complete demolition of the corner buildings. 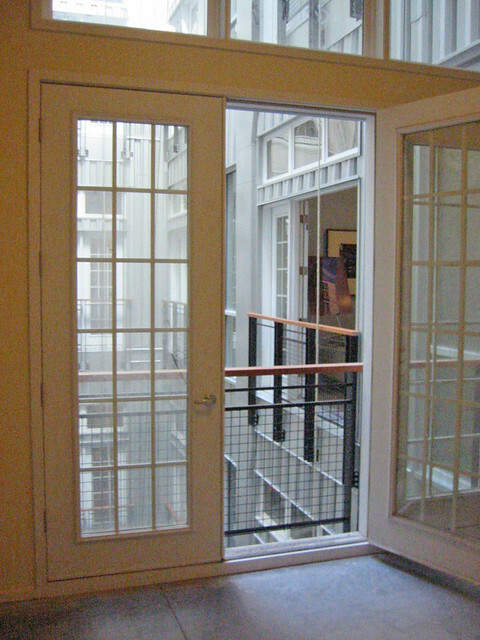 Many Downtown St. Louis developments, including the conversion of the former AD Brown building pictured above and below, have used interior courtyards cut into the existing structures to let light into apartments, condos and hotel rooms. The Laurel on Washington and the Sheraton on 14th Street are additional examples of hotel/residential buildings with interior courtyards. While I'm not fond of the doors used at the Meridian, the concept works. Lame arguments about light, views and giving a building a "proper entrance" are the same excuses that Mercantile Bank (now US Bank) used to demolish the Ambassador Theater in 1995 three blocks east at 7th and Locust. 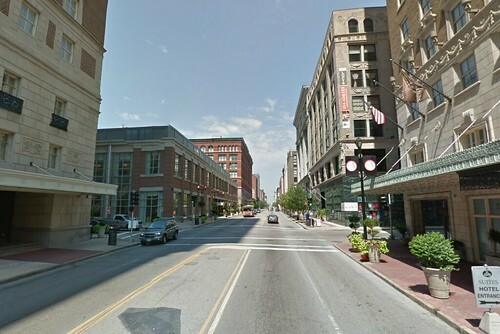 You may recall that the Roberts Brothers planned to demolish the same two buildings at 10th and Locust in 2008 to create a new entrance to a hotel they planned to open in the 917 Locust building. The Roberts Brothers never received financing for that proposal, so the buildings were spared. The real question now is what is the current plan and why would the Board of Aldermen approve a redevelopment plan without knowing what the plan really is? 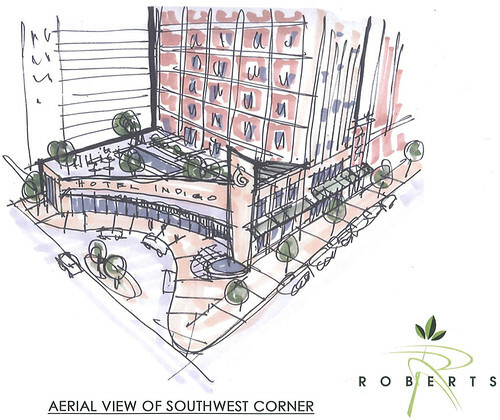 A friend at SLDC mentioned that he had seen a rendering many months ago of a new mid-rise building on the corner, but that doesn't seem to jive with the notion of needing light in the 917 building or talk of loading/drop-off areas, landscaping and pergolas. Apparently only time will tell. 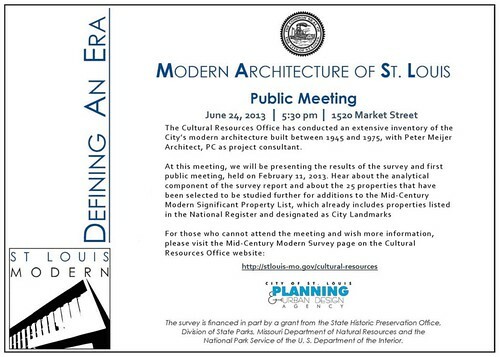 The Cultural Resources Office has announced a public meeting to present the results of their survey of modern architecture in the city of St. Louis. Information about the first public meeting can be found here on B.E.L.T. and here at Preservation Research Office. Some may wonder why this survey is important. B.E.L.T. 's most recent post illustrates vividly how quickly important works of modern architecture can vanish with with little attention.